Sour: My Story - Part 1 of 3: A troubled girl from a broken home. The Brixton gang she nearly died for. The baby she fought to live for. Sour can either be read as a full-length eBook or in 3 serialised eBook-only parts. This is PART 1 of 3. They call me Sour. The opposite of sweet. Shanking, stabbing, steaming, robbing, I did it all, rolling with the Man Dem. I did it because I was bad. I did it because I had heart. And the reason I reckon I got away with it for so long? Because I was a girl. 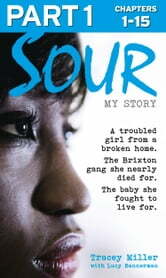 SOUR is the true story of a former Brixton gang girl, drug dealer and full-time criminal. A member of the Younger 28s, a notorious gang that terrorised the postcodes around Brixton in the 90s, Sour escapes a troubled family life to immerse herself in the street life of likking and linking. She never leaves her house without a knife. At the age of fifteen, she stabs an innocent man in the street, earning her unrivalled respect and ‘Top-Dog’ status amongst her crew. She believes she is invincible. But the consequences of her actions are soon to catch up with her. Waking for the second time in two weeks in a hospital bed, to the news that she is pregnant, she realises it’s time to turn her life around. Motherhood will be a rude awakening, but it may also be her saving grace. Told with raw emotions and ferocious honesty, this is the real, on-the-record, story of one woman’s descent down the rabbit hole of gangland, and her efforts, as a daughter, mother and girlfriend, to claw herself out. Libros relacionados con Sour: My Story - Part 1 of 3: A troubled girl from a broken home. The Brixton gang she nearly died for. The baby she fought to live for. I Love You Baby Girl... A heartbreaking true story of child abuse and neglect. Sour: My Story: A troubled girl from a broken home. The Brixton gang she nearly died for. The baby she fought to live for. Sour: My Story - Part 2 of 3: A troubled girl from a broken home. The Brixton gang she nearly died for. The baby she fought to live for. Sour: My Story - Part 3 of 3: A troubled girl from a broken home. The Brixton gang she nearly died for. The baby she fought to live for.